Neapolitan sixth; Galop of the Goblins; guitar. Here's a fun piece. I put a facsimile of it in the "Halloween 2001" edition of the local (Washington, D.C.) guitar society's newsletter. This is the goofy article that went with it . . .
Ok, so I've gone through my music theory reference library and there doesn't seem to be any rule that says a spooky piece has to have a Neapolitan sixth, or that a piece with a Neapolitan sixth has to be spooky. Still, I claim there's something going on here. But before we continue, we'd better make sure we know what a Neapolitan sixth is. My Harvard Brief Dictionary Of Music says: "a sixth chord having as its root the the flattened supertonic." My "International Cyclopedia Of Music And Musicians says: "a chord consisting of a minor sixth and minor third on the subdominant." (Note well: nothing about ghosts in either definition.) I practically had to write a computer program to determine that both of these definitions say the same thing. I've always thought it must be a lonely life for a music theorist, what with only ever being able to talk to yourself. So, for example, in the key of A minor, the Neapolitan sixth is the B-flat major chord, since B-flat is a half step up from A. In the key of E minor, the Neapolitan sixth is the F major chord. 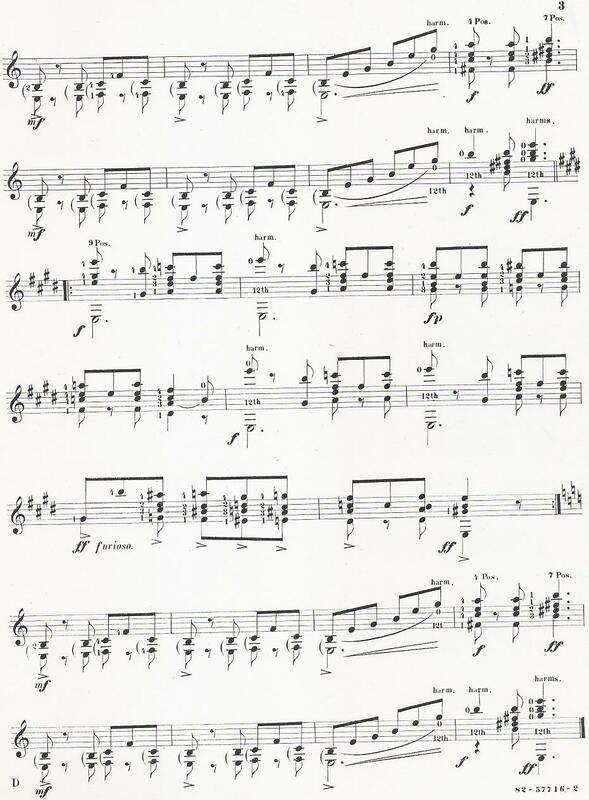 You will find that "The Galop Of The Goblins", which is in E minor, drips with F major chords - to such an extent that composer Walter Fay Lewis apparently figured it was easiest just to leave the F-sharp out of the key signature! (Actually, you can't see this in the tablature. Key signatures? What's that?) In particular, listen to the F major chords in measures 16 and 20. I believe those examples to be very typical of Neapolitan sixth usage. Quite a distinctive sound, yes? So where else do Neapolitan sixths evoke spooks? Well, I couldn't put my fingers on as many examples in my collection as I was hoping to. I have a trio called "Ghost", by Jamie Williams-Grossman (1), also in E minor that has a blast of F major chord in one of the guitar parts. There's a piece by Robin Pearson written for the month of October which has alternating E minor and F major arpeggio patterns. He calls it "Falling Leaves", but we know his real inspiration - October 31st! WGS member Bob Wysong recalls "The Halloween Song", a piece his 7th-grade band played, which used the Neapolitan sixth. Of course, the most famous example of all is heard in the well-known theme song Charles Gounod wrote for Alfred Hitchcock's tv show (2). But, as I said, it can also be used when there's not a ghost in sight. There's a D major chord in Chopin's Prelude In C Minor, but that doesn't hit me quite the same way. Bob also remembered the prominent example towards the end of Albinoni's famous Adagio. The first guitar music example to strike me - and the one that got me and Bob discussing Neapolitan sixths - was in an Andantino by Neapoli- , er, Napolean Coste (3). The piece is in E minor, but listen for the D major arpeggio in the C# minor section. The very first example that comes to Bob's mind when the subject arises is in Fernando Sor's Op. 35, No. 14. Later, I discovered them in Sor's Op. 35, No. 24 (4). I also found them in Mauro Giuliani's Tersicore del Nord, Op. 147 (5). There's one each in the trios to Nos. 7 and 8 of that collection. Below: The Galop of the Goblins, by Walter Fay Lewis, 1894. 3. Das Guitarrespiel, Bruno Henze, book 7, page 11. 4. 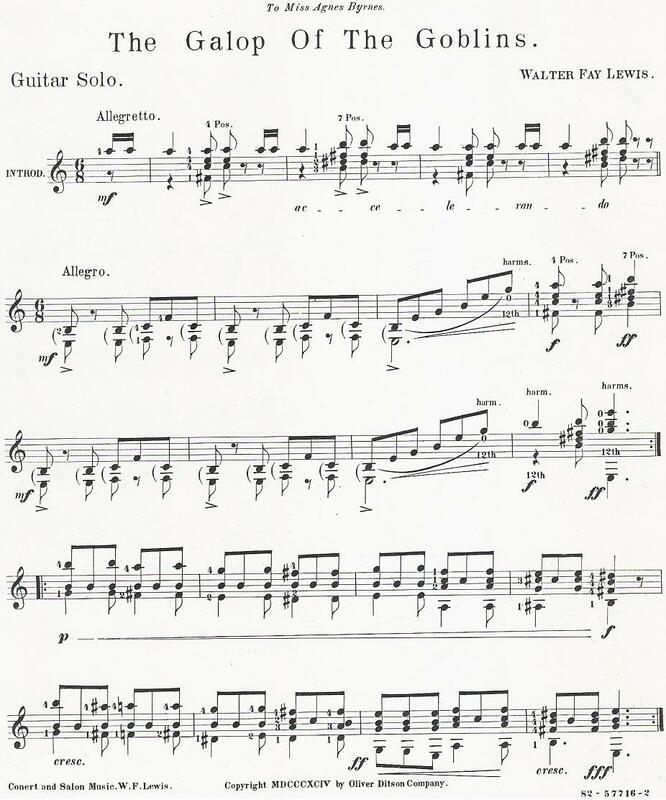 The Classical Guitar, Frederick Noad, page 66. 5. Mauro Giuliani - selected works, Frederick Noad, pp 134-5. I thank the Library of Congress again for making its music collection so readily accessible. This easy-to-read tablature is faithful to the original in music notation. It uses only common keyboard characters - no graphics. It's very simple and instantly usable. Click here for some general comments on the modern tablature, including tips on printing it out perfectly. Source:    Concert and Salon Music; Oliver Ditson Co.
M32p4s1 original showed B#; changed to A# here. with a separate, downward stem, implying an independent bass line. Keep this in mind in the Introduction (Allegretto). In M4-5, original did not show accent marks. Oversight? position; for example, where you see 5554xx, try x10/9/10/9x. Take a moment to fill out the 16th-note beams.
. = rest which applies to the previously sounding note on that string. _ = accent or emphasis mark. Lewis uses ">" in the original. 1 6 10 14 18 22 26 30 33 36 38 42. Last measure is 45. *** Set up your printer for: 96 characters/line (12 characters/inch). The Galop of the Goblins                       GOBLINS: Page 1 of 2. Allegretto. ac-    ce-     le-     ran-     do. Allegro. | | | | | |  | | | | | |  | | | |  |  | | | | | |  | | | | | |  | | | | | |  | | | |. Lewis  Goblins  Leading measures: 35 42. GOBLINS: Page 2 of 2. | | |  | | | | | |  | | | | |   |    |  |   |. Helpful keywords not in the main text: 19th century american guitar music. miss agnes byrnes.